Today, some Midland voters, will decide who will be the latest to join the Midland Independent School District’s Board of Trustees. A race for the District 5 seat is in a runoff between former teacher Heidi Kirk and Midland County Library Director John Trischitti. And voters in this corner of the district have a lot on their minds when it comes to education. Around the Brew St. Bakery, huddles of people are gathering to talk about what they just heard at a school board candidate forum between John Trischitti and Heidi Kirk. 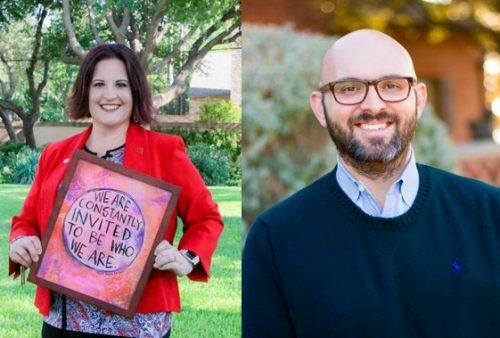 There’s a lot to think about as residents of district 5 — which covers the northern corner of Midland ISD — decide who they’re going to vote for in the upcoming runoff election. “I’ve seen the education performance in the school district deteriorate over the last 15 years and I just think it can be made better,” said Peter Schrenkel, who is married to a teacher in Midland. Schrenkel says he wants someone to address the quality of the city’s schools. Providing educational tools for students — like tablets and smart boards — is a key issue for Whitney Roland. Roland is also concerned with growing classroom sizes across the district. Throughout the district, some officials and parents have called for additional schools to be built. But for Summer Belloni , she also thinks the district needs to figure out how to retain more teachers. That, she adds, can go along way to help with the district’s issues. At the forum, school financing was also a big topic of the night. Audience members asked Kirk and Trischitti their stance on school vouchers and the state policy known as the “robin hood” plan” which takes funds generated by so-called “property wealthy” districts and redirects that money to “poorer” districts. Voters at the forum saw this as unfair, especially when Midland schools are struggling. Amory Skaggs is a young mother and wants this policy reversed before her preschooler enters the district’s schools. Since this specific policy is a state funding issue, the school board can’t directly change the “robin hood ” plan. But this issue and others like it will be on the minds of voters as they choose who will join the MISD Board of Trustees. Election day for Midland residents who live in district 5 will take place on December 11. Polls close at 7 p.m. This entry was posted in KRTS News and tagged District 5, Midland, Runoff Election. Bookmark the permalink.